Born in 1921, Georges Brassens was one of the most popular singers/ songwriters of postwar France. Brassens’ evocative, provocative songs have been translated in over 20 languages and have inspired musicians across all genres. An urban troubadour, he's often been compared to Bob Dylan or Leonard Cohen. The World of Georges Brassens is a look at his legacy around the world and across musical genres. The Brassens Project selected a collection of fifteen titles and trusted their musical ears to find natural connections to other styles. The result is an eclectic mix of jazz, swing, musette waltz, bossa nova, New Orleans, ballads, and reggae, with winks at Django, Antônio Carlos Jobim, Miles Davis, Henri Mancini, and the Eagles. All five members of the quintet have known each other for a while and enjoy jamming together. Each is also involved in several groups and projects in the Ottawa- Gatineau area. Freelance guitarist Pierre Monfils performs with several local vocalists and ensembles in several well-known jazz places in Ottawa. Hélène and Devon are regulars with Moonglow Jazz Ensemble and the Canto Trio. 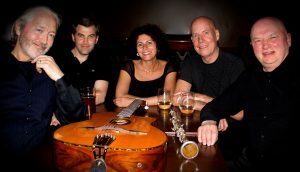 Guitarist Ed Stevens performs with Moonglow Jazz Ensemble, 45north, the Davina Pearl Trio, and in duos with Tim Bedner. Chris plays drums, percussions and piano with Moonglow Jazz Ensemble.